1. Estimates, quotes and contracts work. 4. Captures expenses, time and progress reports for real time accurate invoice. 1. Project based contracts- They basically measure contracts on the basis of profitability and feasibility. They are responsible for relating quotes, labour pricing, billing and estimation etc. 2. Project planning- There has to be some planning and estimation done before passing a contract which majorly includes automatic tasks of scheduling, predecessors, sales distribution and cost information which is performed by Microsoft Dynamics 365 Project Service Automation. 3. Resource management- This section majorly deals with skills and proficiencies of workforce. The right person must be chosen for the right kind of work based on the availability of resources and requirement of job. Tracking resource utility and metrics is also a part of this. 4. Time utilization and collaboration- For multiple projects, web or mobile services can be used to record time and cost involved. The new entries to be included must be checked by the manager and their financial implications must be worked upon. This software allows you to easily collaborate with Office 365 workspace. 5. Project billing- The invoices which are included are based on terms of contract and approved paperwork as well as expenses involved. All the expenses involving revenue, invoices, unbilled amount and real time costs are recorded for analytics and integration of financial systems. 1. 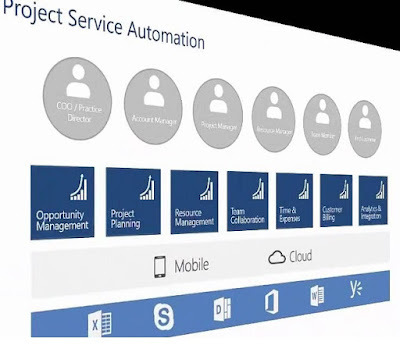 In case you are using it on a desktop or laptop, the project service automation application is used. 2. And for the smaller screen such as tablets and mobiles we have project rescue hub application which is a modified version of project service automation application. This application which we use for smaller screens is basically designed on the unified interface framework, using responsive web designing principles. This enables multiple viewing options and gives a better interaction experience in different kinds of environments. So, these are the basic features that you get with the project automation with Microsoft Dynamics 365. Microsoft NAV 2018 that was launched has been integrated with lots new features. It is the deeper integration of Microsoft NAV and dynamics 365 together. The Microsoft products are deeply integrated with NAV to create a better platform for the business environment. The Microsoft NAV 2018 is an integrated platform with all the Microsoft products. It connects the business environment with Microsoft Dynamics 365 application, powerapps, Flow, office 365, Power BI and various third-party applications. It has been launched as a full software package for the benefits of small and medium scale businesses. Whether it is an excel report such as balance sheets, profit, and loss, cash flows statements, draw balance sheets or anyother financial accounting reports, you can get everything on the new Microsoft Dynamics NAV 2018. The newly launched NAV also features general ledgers, employees’ ledgers, account payables, receivables and individual employee entry reports for the business development. The NAV 2018 has become a one-stop Accounting HUB that provides full information regarding the accounts. Inventory management is something different from accounts management but has a big effect on the financial position of the business. The Microsoft NAV 2018 has surcharges based on the gross weight and volume of the item units. The internal workflow can also be managed by connecting the NAV 2018 with Microsoft flow. Organizations can use this feature to record the inflow and outflow of the inventories, stock management, quotes and orders using Microsoft Outlook as well. The newest feature of Microsoft NAV 2018 includes Microsoft Cognitive services for advanced algorithms. These services allow the users to amalgamate artificial intelligence into the applications. It detects automatic facial, speech, language recognition in context to HR and automates procedures. It also recognizes products and categorizes them correctly. This feature simplifies the product management through automation. 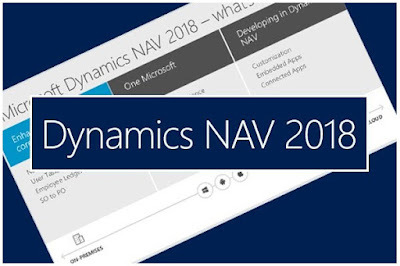 The Microsoft Dynamics NAV 2018 is a state of the art extensibility model which enables customization according to clients demand for business development. The setup and extension button is placed in one place to provide benefits to the business manager and accountant role centres. With the new Dynamics NAV version, the developers get to learn new things by adopting new rules.